New York City apartments could usually use more storage space. 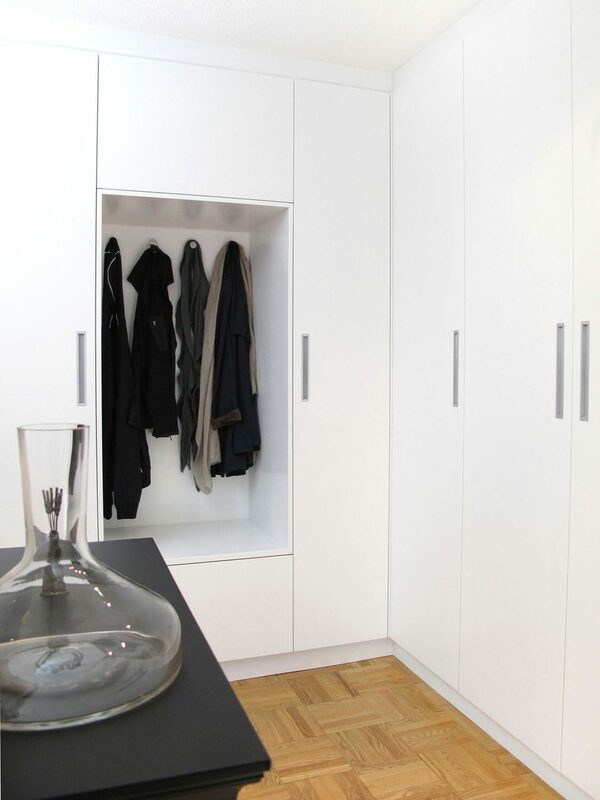 In order to make the most of closets, those hard-to-reach spots have to become functional; this can mean custom shelving, drawers, or hanging options such as sliding racks, hook, or rods. 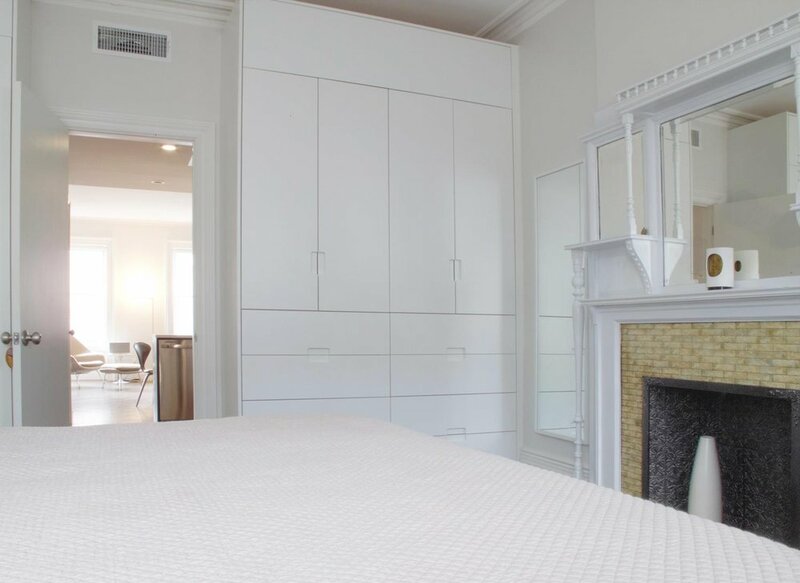 In some cases, tearing out the existing closet and replacing it with custom cabinets or built-in wardrobes makes it easier to have everything accessible, and can even make bedrooms appear larger. Storage under beds, or vertical storage columns attached to beds, are also great options to increase storage space in bedrooms. 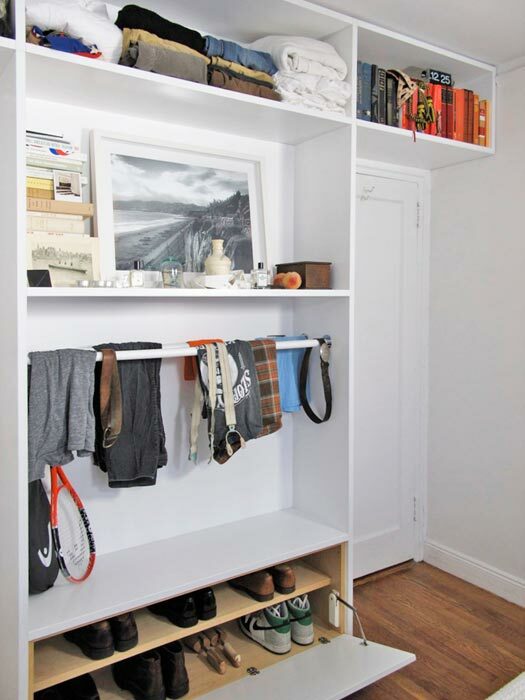 Shoe storage in mudrooms or entryways can also be optimized with shoe trays, custom shelving, or organizers. Whatever you choose, with proper planning, well-designed organization in your home can save both space and time. 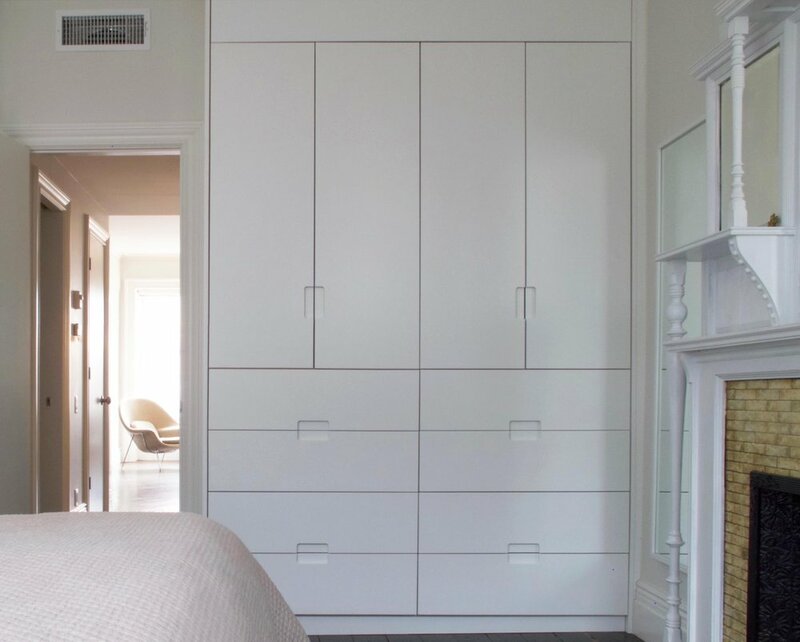 This tall wardrobe built into the bedroom allows more storage and accessibility than a traditional closet. The aesthetic is modern and simple with clean lines, to keep the room looking spacious and serene. 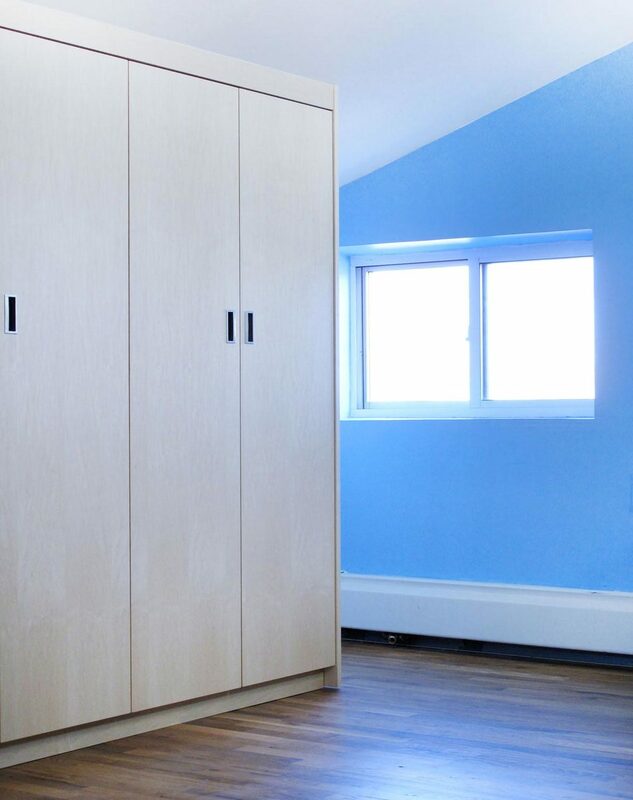 The tops of these closets were sloped to accommodate the angle of the roof. The inside of the closet was at just the right angle to allow hangars to dangle without bumping into the back of the closet. The drawers were unconventionally tall, but the top drawers were for the husband of the couple (who is pretty tall). These were built-ins for bedroom storage, including rods for hanging belts and clothes that need to air out, and a covered shoe trunk. This closet sits in an entryway, and includes custom shelves that are just the right size for golfing shirts and clubs. A hatch door with a touch latch. 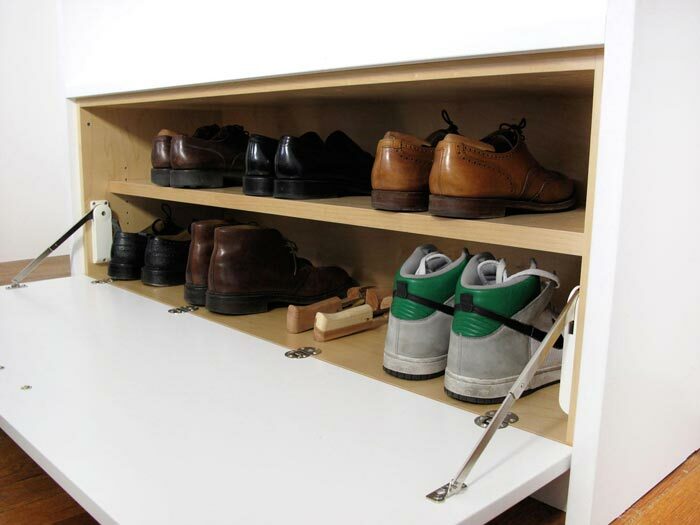 This custom-built shoe organizer maximizes space in the entryway; the shelves were made to fit shoes, both flat and tall, as well as winter items such as hats, gloves, and ear muffs. This client had a home office on the ground floor of a Park Slope townhouse. We used the underutilized space under the staircase to build deep file drawers and a place for a printer. Custom drawers and shelving inside large cabinets provide extra layers of organization. Outlets can be built into the inside of the cabinets, for printers or AV equipment.